If you take Thanksgiving as seriously as I do, you’re already planning your Turkey Day meal. If you’re normal (unlike I am) you probably wait until the last minute to start the planning process. These Balsamic-Rosemary Roasted Brussels Sprouts are for both types of people. They’re easily worked into any menu. They can also be added at the last minute. Yet, they satisfy a whole hosts of dietary needs/restrictions. Brussels sprouts is the proper name for the veggie. Colloquially, at least here in the States, they’re referred to as “brussel sprouts”. Unfortunately, while forgivable, that’s not their correct name. 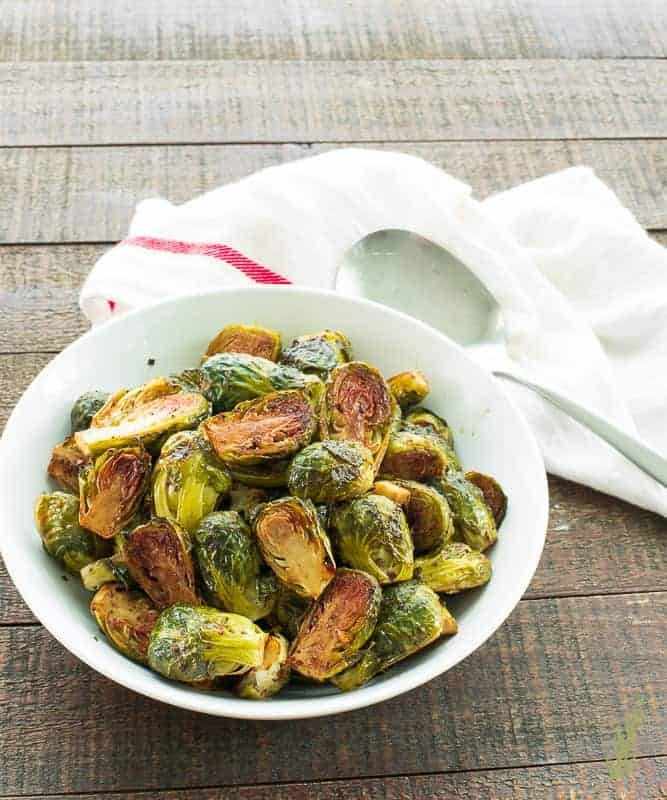 The sprouts were named after the city close to where they were discovered- Brussels. A singular sprout is called a Brussels sprout, multiple are Brussels sprouts. Now that my naming peeve has been addressed, let’s discuss what they are and why some people hate them. While not technically cabbages, they are related to (and closely resemble) the larger green cabbage. Like cabbage and broccoli (another family member), they contain a natural element called glucoraphanin. When a Brussels sprout is chewed it reacts with another enzyme to transform into the compound sulforaphane which causes both the glucoraphanin and the myrosinase (the enzyme I mentioned before) to react. The result? Read that compound’s name again and take a wiiiiild guess. Yep! Sulfur. It smells like a fart. Rest assured, these Brussels sprouts are prepared in the best way to avoid that hideous taste/smell. I find that boiling Brussels sprouts is the worst way to prepare them. Roasting is the best. When they overcook they not only become visually unappealing, but they tend to taste more like stink. Tossing them in a herbed balsamic vinaigrette and roasting them brings out flavors you never thought possible. So, let’s do the impossible. Simplicity at its finest. You’ll need balsamic vinegar (choose a good quality vinegar as this is a prominent flavor). Olive oil, fresh rosemary, garlic, salt, pepper, and of course, Brussels sprouts. This recipe is perfect for doubling, or even tripling, so if you need to make it for a larger crowd do so fearlessly. 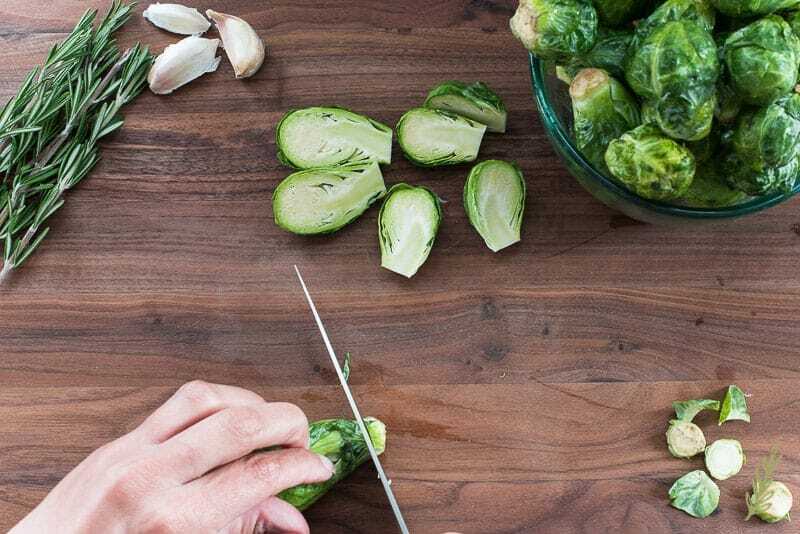 Once you’ve gathered all your ingredients, use your chef’s knife to slice the dried, woody ends of the Brussels sprouts off, then discard the stems. The sprouts…well, they sprout from a stalk. It’s actually a really cool thing to see. Anywho, once they cut the cute, little sprout from the stalk, the exposed end gets all dessicated and gross, so we lop it off to avoid getting a mouth full of yuck. Use this time to check out the outer leaves on the sprouts, too. Remove and discard any that are brown, dried, or otherwise look like crap. After you’ve trimmed the sprouts, slice them in half lengthwise (through the stem end). 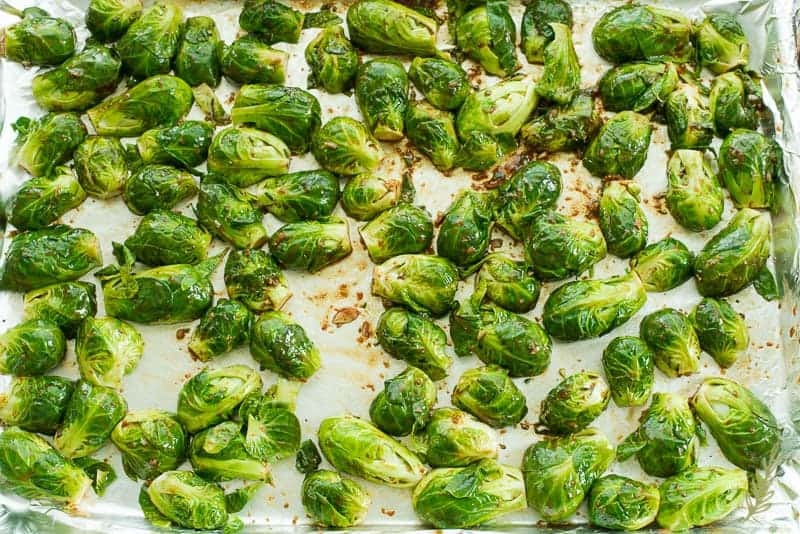 Once you’ve prepped the Brussels sprouts, you can put them onto your half sheet pan, or in a roasting pan. I line my pans with heavy duty aluminum foil because it makes cleanup easier. Once you’ve got the veggies on the pan, just set the pan to the side while you prepare the vinaigrette. The first thing you’ll need, besides high-quality balsamic vinegar, is fresh rosemary. If you’re a big fan of the wintery herb, use three stalks. I’m using two because I’m a bigger fan of the balsamic flavor. Just don’t go overboard! You can go from rosemary to pine cone flavor in a hot minute if you use too much. Use your forefinger and thumb and grip the top of the rosemary stem. 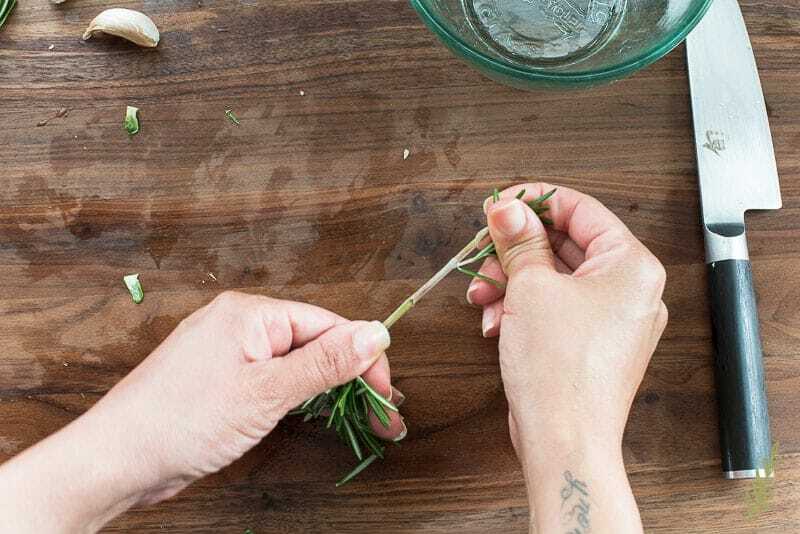 Use your the fingers of your opposite hand to remove the rosemary leaves by sliding your fingers, pinched around the stem, in a downward direction. Once you’ve removed the leaves, finely chop them. You know how I feel about buying large cutting boards and using them as a complete surface. This is where those boards come in handy. You can either put the rosemary into your mixing bowl, or just slide it to the side. Now, if you don’t have access to fresh rosemary, use dried. Use half the amount called for, and crush it in a mortar and pestle- or, better yet, purchase it already crushed. Whole, dried rosemary leaves are too stiff to use in this recipe. 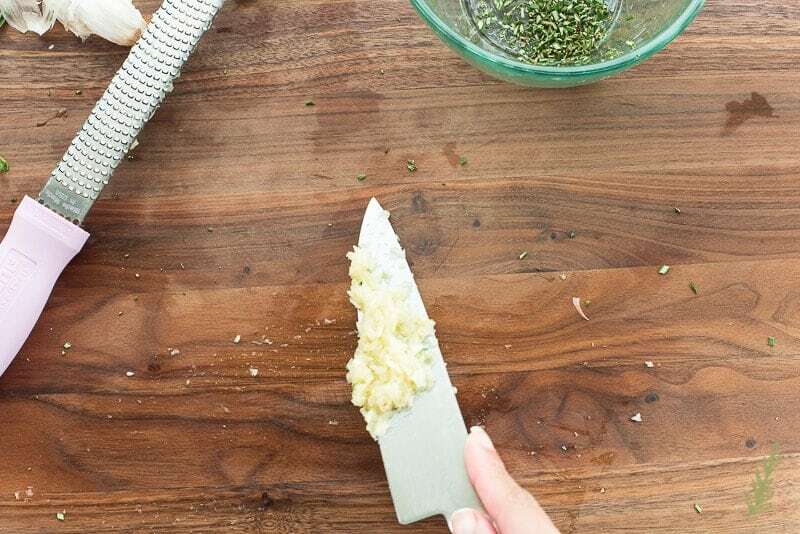 Use your microplane to grate the garlic. Scrape up the garlic and deposit it into the mixing bowl with the rosemary. Add the kosher salt and freshly ground black pepper to the bowl. 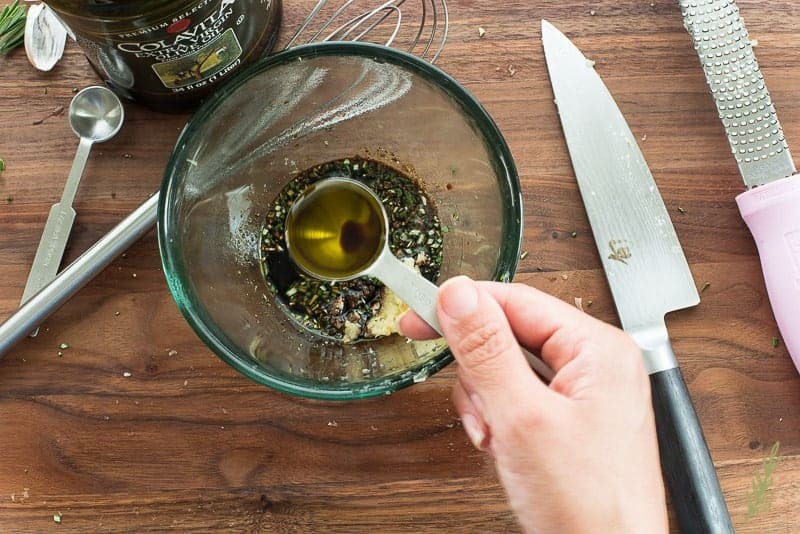 Finish the Balsamic-Rosemary vinaigrette by adding three tablespoons of balsamic vinegar to the ingredients in the bowl. Add one tablespoon of extra virgin olive oil and a half tablespoon of dijon mustard- both act as an emulsifier for our vinaigrette. 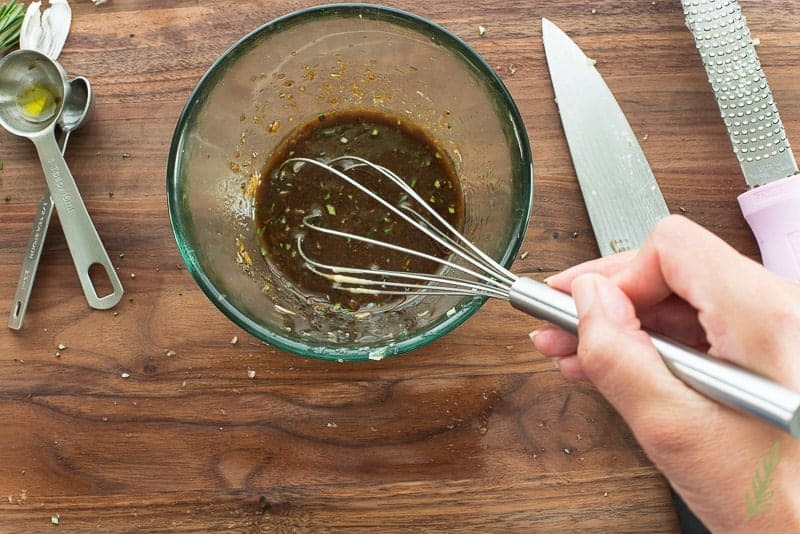 Whisk everything together until it looks like a smooth sauce. 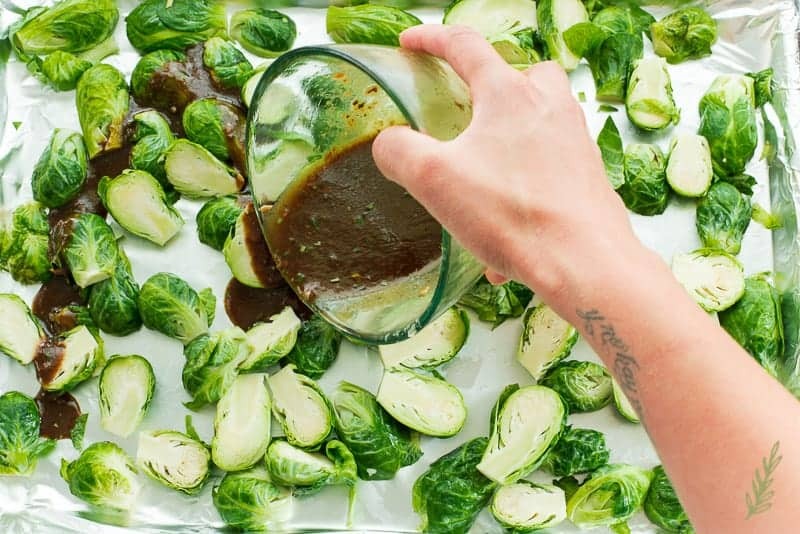 Pour the Balsamic-Rosemary vinaigrette over the Brussels sprouts you loaded onto the sheet pan earlier. 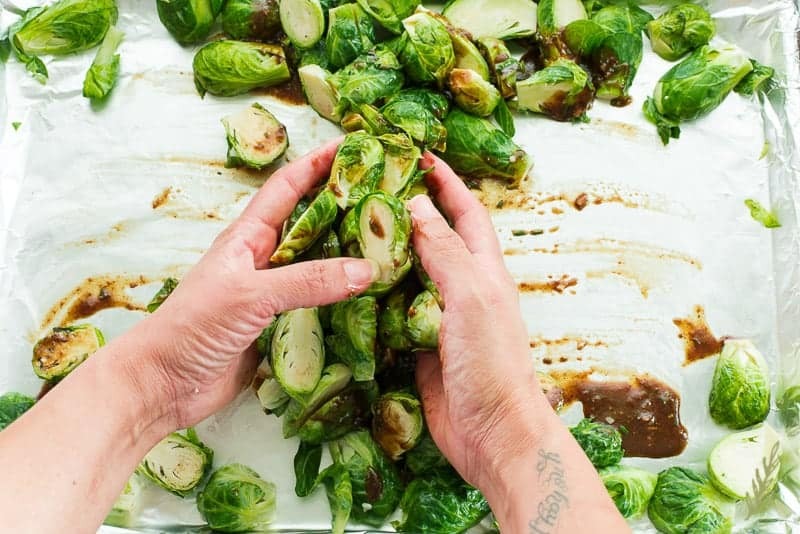 Use your hands (or a spoon if you absolutely love doing dishes) to toss and coat the sprouts in the vinaigrette. Roasting is a dry-heat method of cooking a food at higher than average temperatures to encourage caramelization of sugars in the foods. 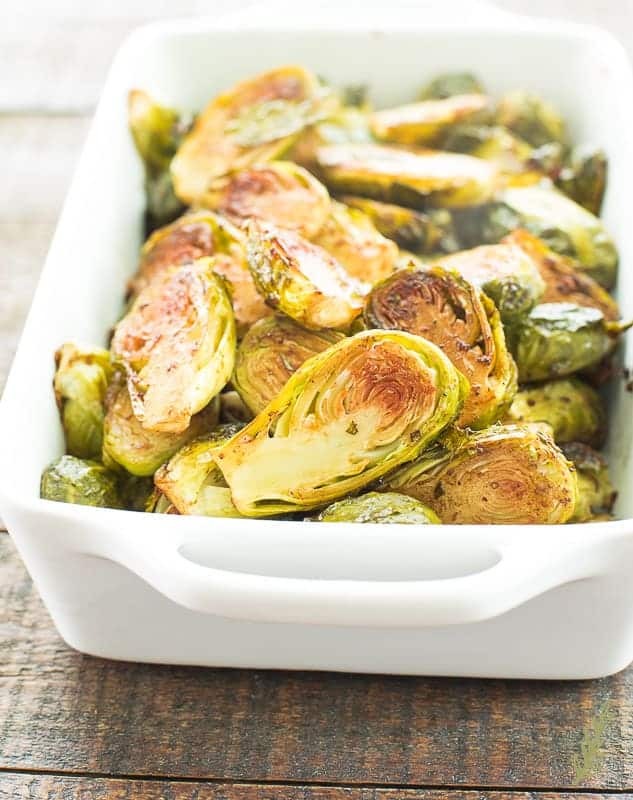 The hot air in the oven surrounds the food with indirect heat and produces that nice crust that creates the exceptional flavor of these Brussels sprouts. Once the sprouts are completely coated in the vinaigrette, flip them all over onto their flat, cut, sides. When the interior of the sprout is pressed up against that hot metal, it begins to caramelize and take on a deep, rich flavor. It also causes the surface to crisp in the most delightful way. LOOK AT ME! All Mary Poppins and junk! 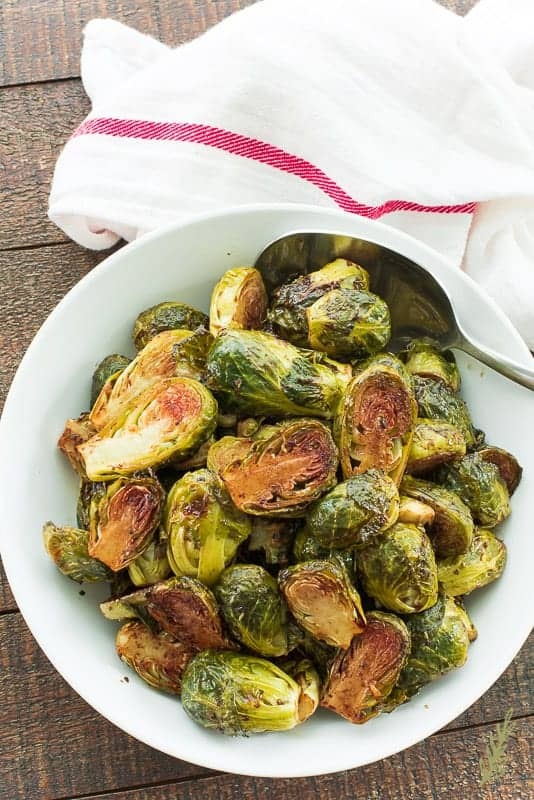 Once the sprouts have roasted for thirty to thirty-five minutes, they’ll take on a dark, golden brown and have crisp leaves which are beginning to unfurl. Gorg!! Let’s take a moment to reflect on that caramelization that’s beckoning us. You good? I’m good. 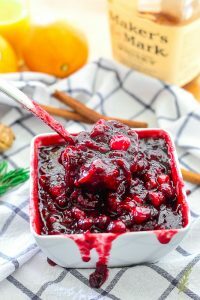 Let’s grab a spatula and transfer them to a serving dish because these are best served hot! These Balsamic-Rosemary Roasted Brussels Sprouts are going to steal the show this holiday season. Because you made them, you’ll be like the Joe Jackson to the sprouts’ Jackson Five. I mean, without the alleged child abuse scandal. You’d never “allegedly” beat the sprouts, I know you better than that. 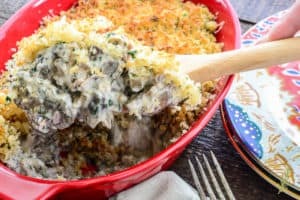 Pin this recipe for your holiday meal planning- whether or not you wait until the last minute to actually plan it? That’s your affair. This recipe may be doubled or tripled to feed large crowds. Preheat your oven to 400°F. Line a sheet pan (or roasting pan) with aluminum foil, or spray lightly with non-stick cooking spray. 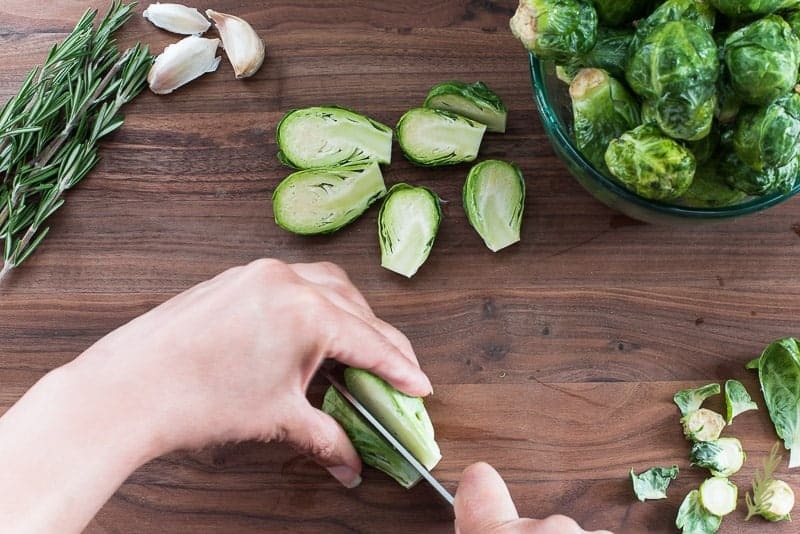 Use a knife to slice the dried, woody ends of the Brussels sprouts off and discard, then the ends. Remove and discard any outer leaves that are brown or dried out. Slice each sprout in half lengthwise (through the stem end), and place them onto your prepared roasting pan. Use your forefinger and thumb and grip the top of the rosemary stem. 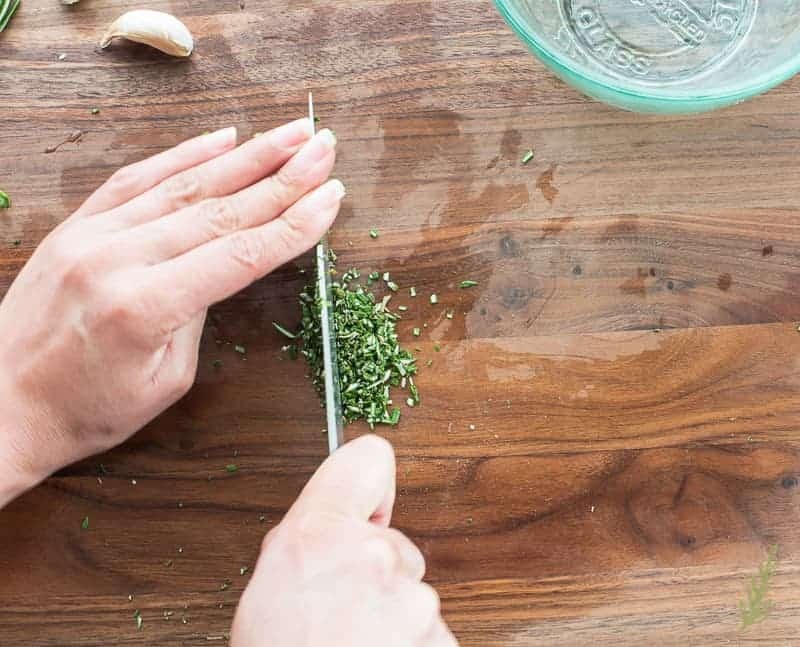 Use the fingers of your opposite hand to remove the rosemary leaves by sliding your fingers, pinched around the stem, in a downward direction. Finely chop the rosemary leaves. 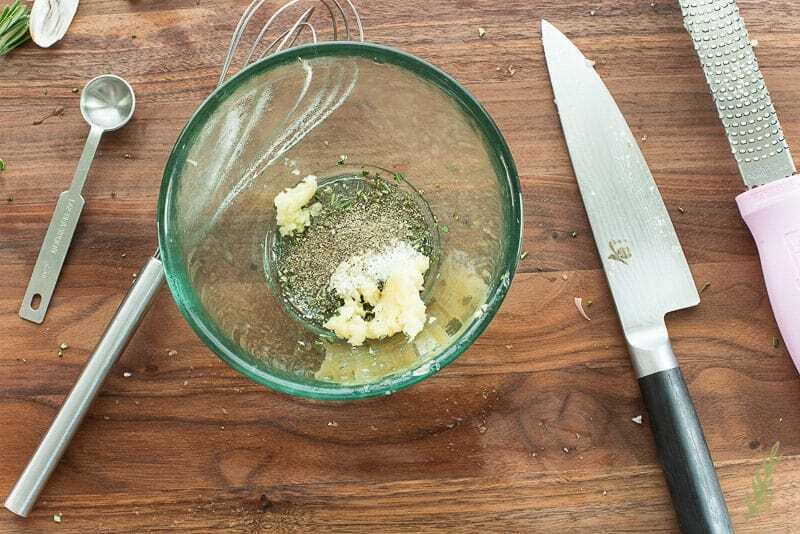 Use a microplane to grate the garlic, or mince it with a knife. Add the rosemary leaves, garlic, salt, pepper, balsamic vinegar, extra virgin olive oil, and the dijon to a medium size mixing bowl. 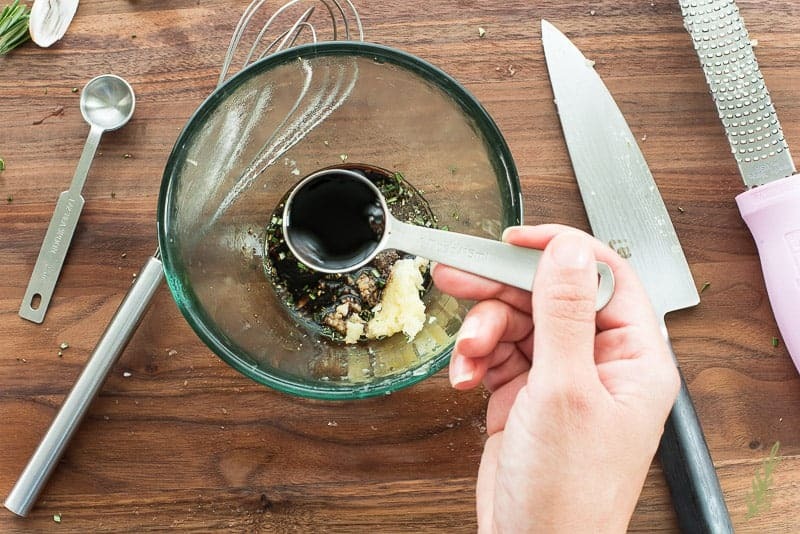 Whisk everything together until you have a smooth, emulsified dressing. 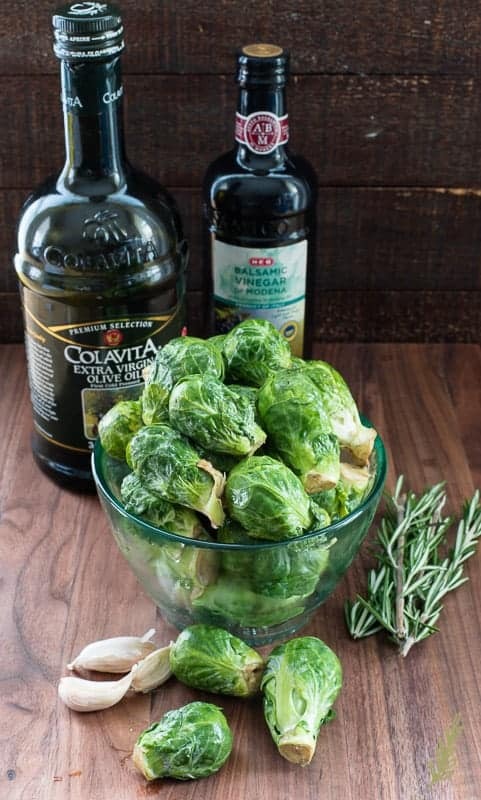 Pour the Balsamic-Rosemary vinaigrette over the Brussels sprouts, and toss to coat the them in the vinaigrette. Arrange the sprouts so they are all lying on their flat, cut sides. Put the pan into your preheated oven and roast for 30-35 minutes. The sprouts should be a deep caramel color and the leaves should be crisp. Remove the pan from the oven once the sprouts have finished roasting, and use a spatula to transfer them to a serving dish or your plates. Enjoy! Whole, dried rosemary leaves are too stiff to use in this recipe. Dried rosemary can be used in place of fresh leaves, but you'll need to crush them in a mortar and pestle to soften them; or you can also purchase it already crushed. Use only a 1/2 tablespoon of dried leaves. 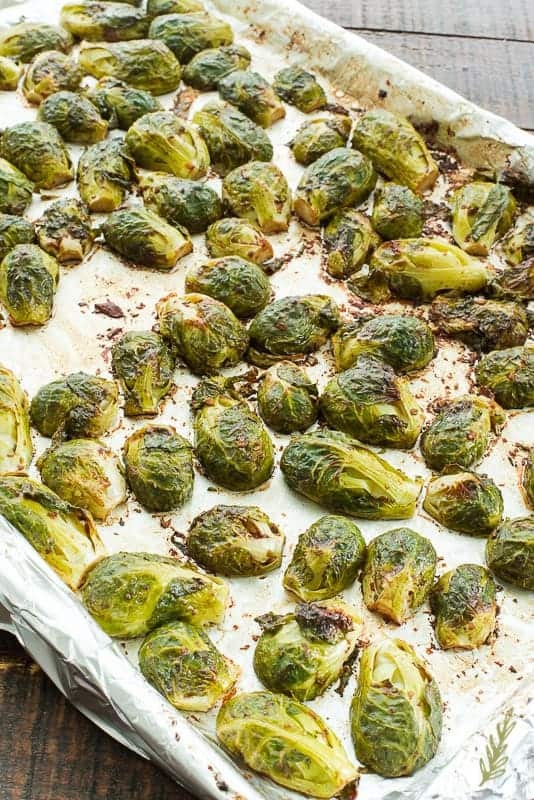 The sprouts are best served right out of the oven. If you need to hold them, do so in a warm oven or in a slow cooker set to warm for no longer than 2 hours. The vinaigrette can be made up to 3 days in advance. Shake the dressing to emulsify it just before pouring over the Brussels sprouts. Need more ideas for you holiday menus? I love love love your process pics! Brussels are my fave and adding balsamic to them just puts them over the edge, obsessed!!! I’m so glad you enjoy the images, Jenna! 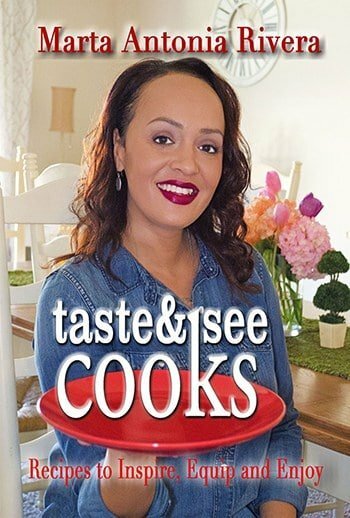 I hope you love the recipe as much as we do! Thanks, Paula! It’s definitely perfect for the upcoming season. I bet these taste amazing! I love Brussels with balsamic! Obsessive planner here, and I’m adding this to my Thamksgiving binder. (Really, I have an actual binder.) 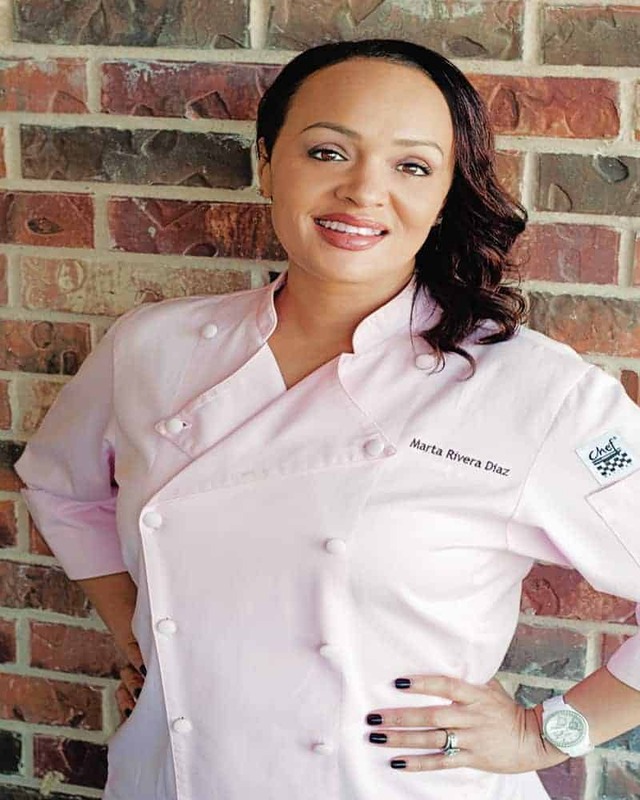 I’m a vegetarian and am always on the lookout for flavorful dishes. This looks perfect! How much do I love that you have a Thanksgiving binder, Christa?!?!!? 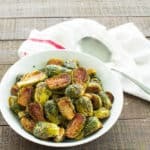 this looks so great!I love brussels sprouts, or brussel sprouts! Wow, these look delicious! Roasting brussel sprouts are my favorite way to enjoy them! I’ve never thought to try them with rosemary but will next time! You really should, Amber. I think you’ll really like it. Aren’t they great, Cindy! I love that kiddos enjoy it! Oh wow this looks so good! I have a similar recipe for a steak marinade with the same flavors. Yum! Yes!!! Steak with these flavors is one of my favorites, Holly! Heck. Yes. This looks absolutely delicious! I only like Brussels sprouts when they are baked or grilled (can’t handle them raw or steamed, bleh). But figuring out new, simple, healthy flavor combos can be tough! I have gotta try these! Yes, boiled Brussels sprouts are the devil, Rachel! LOL! I do try, Aditi! Yum! This looks sooooo yummy! I want to make it for dinner. I love that it’s easy to throw together, even at the last minute, Cassie!